After a whirlwind of handing in, packing up, moving out, and arriving and getting set up back in the States, it’s finally time to share the work I have been building over the last year. I received my marks last week, and am excited to share that I have officially graduated with distinction and the Oxford Internet Institute MSc Thesis award for this work. Now I’m pleased to share the finished product with the QS community, my participants, and anyone else who has been interested in following my research. Between the internet, social media, sensor-enabled devices, and established industrial transactional systems, we are living in a world with more data about ourselves than ever before. Public discourse has largely focused on the opportunities for firms or the risks to individuals as this data environment expands. These framings do not give individuals enough practical understanding of how data impacts and integrates into their lives. The Quantified Self community is an advanced- user community of people who have begun to explore and experiment with novel uses of personal data. As the Homebrew Computer Club’s hobbyist experimentations paved the way for the personal computing revolution, the Quantified Self community offers a glimpse of what engagement with personal data in our everyday lives might soon look like. Through ethnographically-informed interviews and participant observations, this research explores how self- trackers derive personal meaning from personal data. I present a lifecycle of personal data use: from deciding what to track, through collection, analysis, and future uses. I explain how current barriers to use expose the need for revised policies to support individuals’ personal interest in the use of their data. By analyzing the metaphors individuals use to explain their personal uses of data, I put Quantified Self tracking practices in historical context and illuminate the novel affordances that self-knowledge through data provides. I argue the QS community offers ways of framing and engaging with personal data in our everyday lives that can help society at large begin to understand our roles as data selves in a Big Data world. I’m proud of this work, but it is not without some compromises. We had only 10,000 words, but I probably could have written 100,000 from all the material that came out of my conversations with the QS community. And time permitting, I would have loved to keep talking with more people. I could have written an entire chapter on the legal and policy implications of the ways that the QS community expects to be able to use their data, but that in itself would have taken 10,000 words. And I could have spent 10,000 more words just telling individual stories, but instead I had to push those detailed profiles to the appendix. A lot of words were spent establishing methods, boxes that needed to be checked to demonstrate my mastery of my chosen social science methods for the program. In the end, I’m most pleased that I was able to ask the questions I found most interesting while working within the bounds of an empirically-focused, interdisciplinary department. I’m posting this thesis here “as is,” with only a few minor edits post-submission to the exam schools. “As is,” in the sense that this is a work completed in fulfillment of my Masters program. It’s an artifact of an academic experience with a specific context and purpose. It’s not indicative of the type of writing I aim to do going forward. Thankfully, there’s plenty more to write about in future articles and in the book, and in a more accessible, less jargony way. In the meantime, I’d love to hear your thoughts! PS. 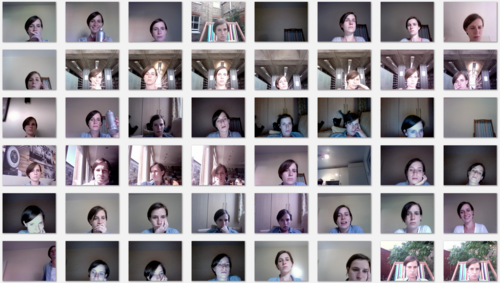 Here’s a webcam shot of me taken using Stan James’ LifeSlice, one of the Quantified Self tools I was playing with throughout my thesis process. 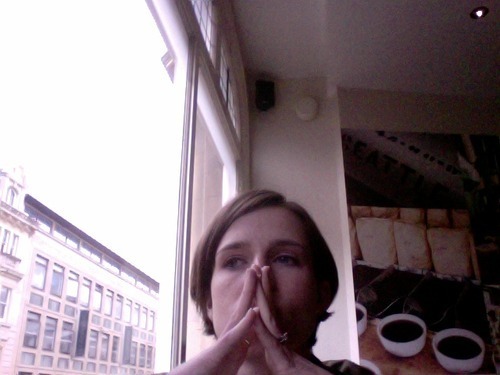 Here I’m caught pondering edits in the Cornmarket Starbucks. And the final days of editing.